Let's try this instead: Imagine you're rich. See? We're having more fun already. Like most Americans, rich you has all kinds of opinions on the way things ought to work in this country. But unlike most Americans, rich you is, well, rich. That means that if you want to influence the political process, you have options outside of signing petitions or calling your Congressperson's office to yell at one of the interns. The most direct route is to use your money to fund political campaigns. In this day and age, members of Congress don't get to be members of Congress without spending some serious money first. That's where you come in. Now of course, there are rules. Federal law sets certain limits, so you can't just go write a candidate a check for a million dollars and call it a day. That means you, dear hypothetical rich person, can't give more than $2,600 to any one candidate per election. Even if you were to donate once in the primary election and again in the general, the absolute most you could give to an individual candidate's campaign is $5,200. Just giving that much would put you in a very exclusive club. In the last election cycle, a minuscule 0.08 percent of the population made more than $2,500 in political contributions. This isn't terribly surprising once you consider that the absolute maximum donation of $5,200 per candidate per election cycle is more than the average American family makes in an entire month. But if you're part of that 0.08 percent of the population that has money to burn on political giving, why stop at one candidate? Why not dole out $5,000 bucks to a hundred different candidates just to be safe? That's where McCutcheon v. FEC comes in. Before the McCutcheon ruling, there was also an aggregate limit of $48,600 on contributions to candidates. That means that you'd be legally barred from donating 1,000 bucks each to 49 different candidates, because even though those $1,000 donations are below the individual candidate limit, that $49,000 in total contributions would put you over the aggregate cap. This same principle applies when it comes to national party committees and other political action committees, but with a higher aggregate limit of $74,600. The important thing to remember here is that if you want to buy political influence, your ability to make direct contributions maxes out at $48,600 to candidates and $74,600 to Political Action Committees (PACs) -- for a total of $123,200. At least, that's how it used to work, because the Supreme Court just made the aggregate limit history. Since the individual cap is still in place, that might not sound like a huge deal. After all, if giving $1,000 bucks to 48 different candidates isn't an issue, why would giving $1,000 to 49 be any worse? 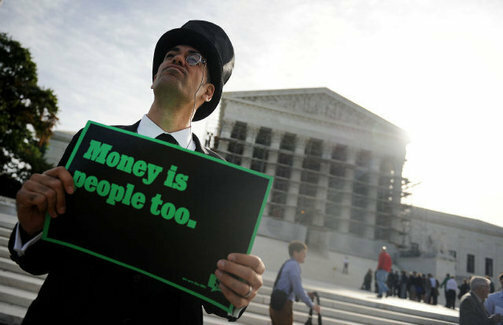 That was McCutcheon's argument, and it's one that the Supreme Court clearly bought. But this is where things get upsetting, because it's the clearest indication yet that the current majority in the Supreme Court has no earthly idea how money in politics actually works. That "48 is fine, why is 49 bad?" argument sounds reasonable on its face, but it doesn't account for an everyday reality of modern campaign finance called the joint fundraising committee (JFC). Joint fundraising committees let political operatives haul in huge checks from big donors, then distribute them out to candidates and PACs. Under the old aggregate limit, it used to be that the most a donor could show up with was $123,000. Now, one donor can cut a $3.5 million check to a joint fundraising committee. The kind of people who are willing to drop more money than most Americans will make in their entire lives on one election can now wield enormous leverage over entire political parties. That means a big donor could go to the head of a JFC and says "gee, I'd sure love to send this $3.5 million your way, but I can't do that until I'm sure none of it will go to candidates who support closing a tax loophole I like." Suddenly, the head of that JFC has 3.5 million reasons to call up every single member of his party and make sure that everyone is on the same page about keeping that tax loophole open for another couple of years. At which point everyone has to raise money to run for office again, and the whole cycle starts over. The McCutcheon ruling also did away with the aggregate limit on donations to political action committees, or PACs, which can give money directly to candidates. This, ladies and gentlemen, is what makes McCutcheon v. FEC one of the absolute worst Supreme Court decisions of all time. While there's a limit on how much PACs can give to each candidate, there's no limit on the number of PACs that can exist. Without the aggregate limit, one donor can now give $5,000 each to 1,000 different PACs. And those 1,000 PACs can turn around and funnel that money straight to one candidate. Which means that one candidate could haul in $5 million in direct contributions from one donor, funneled through a network of PACs. That's a level of political corruption this country hasn't seen in more than a century. I'm not going to sit here and try to spin this as anything other than a horrible ruling. But truth be told, all the Supreme Court did was make a terrible situation marginally more terrible. Even if McCutcheon had gone the other way, we'd still be living in a country where the people who can throw campaign fundraisers and hire lobbyists get better treatment from our elected leaders than the people who can't. We'd still be in dire need of a wide range of anti-corruption reforms, like those outlined in the American Anti-Corruption Act, that stand up to constitutional muster even under our current Supreme Court. Today, as the ruling was handed down, people all across the country turned out at over 140 events nationwide in protest. This wasn't some fluke -- a coalition of over 20 public interest groups staffed by intelligent, passionate, and dedicated people helped bring it together. And even more importantly, even in our current political climate of breathtaking cynicism and House of Cards, Americans from every corner of this country still decided to show up and take a stand. And more people are joining them every single day. There's this story a great legal activist named Lawrence Lessig likes to tell when he talks about this fight against corruption, and I think it's worth repeating here. When Ben Franklin was carried from the Constitutional Convention in September 1787, he was stopped in the street by a woman who said "Mr. Franklin, what have you wrought?" Franklin replied: "A republic madam, if you can keep it." On days like today, it's hard not to feel like we're losing that republic. But our republic can't be truly lost until the people stop fighting to keep it. From what I've seen, that fight is only just beginning.